A couple of years ago one of my poems was selected for an international women’s online publication. This poem reflected my reverence for my body. Our bodies are amazingly designed, a masterpiece of complex interconnectedness. Yet, we women have been subjected to the media definition of what our body should look like. Most of us do not fit the bill. We’re not skinny enough, too curvy, not the right hair color, too old etc. What makes me sad is that many of the print models are airbrushed to look the way they do, giving us a false impression. Stripped down, they are no different than the rest of us. The good news is we are breaking down some of these image stereotypes. I see the younger gals going more natural wearing little to no makeup. I see baby boomers, my generation, claiming our aging, celebrating our accomplishments that are reflected in our wrinkles, our grey hair, Our bodies change as we grow older, we fill out, more flexible and use our sexuality more creatively if we choose. 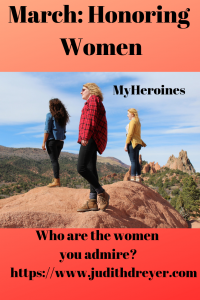 Who are my heroines? There are so many to choose from. On a recent post, I highlighted Jean Houston, Caroline Myss, and Marianne Williamson. 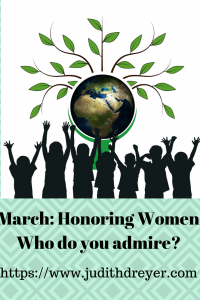 For this month’s national and international theme of honoring women, chose my earth teachers. Seeds: Vandana Shiva: Seed Saver Extraordinaire! Scientist, pioneer, rebel, activist, saw the handwriting on the wall. When big chemical companies were introducing seeds injected with systemic pesticides she inherently knew those kinds of seed manipulations could cause unforeseen consequences. I have read she has had to face great obstacles in her travels of spreading her vision. I admire her courage and fortitude and guiding light. Plants and Medicine: Rosemary Gladstar: One of our Herb Mothers: I have had the privilege of studying herbal medicine with Rosemary. She and others awakened the herbal movement in the early seventies with the advent of the Aids epidemic. Many fellow herbalists sought out native elders and learned rituals, ceremony to honor the earth. They, in turn, became our teachers, instilling reverence for the species we harvested and consumed. Rosemary began in California, founded California School of Herbal Medicine, moved to Vermont and began Sage Mountain Herbs. She’s a co-founder of United Plant Savers and the International Herb Symposium, a biennial event, one I have attended and highly recommend. Herbalism has matured. Many of the presenters share their vast experiences of using herbal medicine in practice and offer practical, tested advice. I admire Rosemary for her activism in protecting plant species and offering reliable herbal knowledge. Earth Partner: Pam Montgomery: Pam was my first herbal teacher. We spent several afternoons way back when, as teacher and student, learning about wildcrafting in responsible ways and learning how to make herbal preparations for family and friends. Today, she is the founder of Partner Earth Education and has now transitioned into Wake up to Nature, in Vermont. Pam too is an activist seeking to awaken us to our partnership with nature. She is one of the founding members of the Organization of Nature Evolutionaries. or O.N.E. This relatively new organization is working with other organizations that seek to have the legal rights of nature finally recognized. They offer ceremony and ritual to help us feel nature’s deep presence. I respect Pam’s dedication and deep commitment. All three women embody advocacy, education, and action. Today we have many environmental problems. Like many others, I seek to follow those who inspire us to a more responsible partnership with this earth. Is it easy? No, but that’s where passion and courage come in. We all have unique gifts and talents and as my guest this week reminds us, we can make a difference one project at a time and create change. So thank you Kelly Rafferty and Kyleigh Hillerud for sharing your story. How in eight short months you took proper action, offered education for informed decision making to your college campus and today celebrate zero plastic bags on campus. Know you are in good company. Established women, young women starting out, making a difference, Isn’t it great!.